It's streaming off Netflix as of this weekend (as is Batman Returns), presumably to capitalize on Keaton's comeback in Birdman and the Tuesday release of the 1960s show on Blu-Ray. Since I hadn't seen the movie in about fifteen years or so, I decided to give it a shot. Much to my surprise, I really liked it, maybe a lot more than I did when I first saw it as a teenager. It's not a perfect movie by any means, but it holds up surprisingly well, even against today's sophisticated superhero cinema. Batman is arguably ground zero on the modern wave of comic book adaptations, more so than Superman over a decade earlier. Most people, even non-comics fans, have a pretty general idea of who Superman is and what he's like. In the late '80s, though, there was a lot of concern on the part of fans that Burton's Batman would simply be a replay of the old Adam West show, and not the tragic super-detective of the comics. Their fears were confirmed by the news that Burton had cast Michael Keaton, then best-known for comedic roles in Mr. Mom and Burton's own Beetlejuice, in the role of Batman/Bruce Wayne — a surefire sign that Warner Bros. was going the wacky route. Oddly enough, in the wake of both the terrible Schumacher Bat-films and Christopher Nolan's deadly serious Dark Knight Trilogy, the 1989 movie has gotten a rap for being a lot campier than it is, thanks to Burton's cartoonish sensibility and Nicholson's scenery-chewing Joker. I think this is more true of Burton's 1992 sequel, which is a lot goofier. But when Nicholson — or the totally superfluous Robert Wuhl as "comic relief" Knox — is offscreen, the tone is a lot more melancholic and weird. And "weird" is the key word here, more so than "dark" or "serious". Batman is often seen as the capstone of the blockbuster culture of 1980s Hollywood — one reviewer dubbed it "The Movie Of The Decade," a blurb that was repeated ad nauseam in publicity materials — but apart from some signifiers it doesn't feel like a 1980s movie at all, fashions aside. When you consider all the approaches popular at the time the filmmakers could have taken — Indiana Jones-style caper, Stallone-type action vehicle, Eastwood-type vigilante flick, Die Hard-style action comedy — it ignores them completely in favor of an atmosphere of mystery and dread, embodied by Anton Furst's production design, which owes more to '80s outliers like Blade Runner and Brazil than anything else. (Gilliam's influence here is actually stronger than either Spielberg or Lucas's.) Bruce Wayne barely registers except through his interactions with other characters like Alfred and Vicki Vale. The pacing is slow and somewhat disjointed, and the structure is episodic. (Narrative has never really been Burton's forte, though it's also worth noting that production on the movie coincided with the 1988 Writers Guild strike.) There isn't a whole lot of action, just three main setpieces (Axis Chemicals, the Fluegelheim Museum, and the final showdown). Batman barely appears for the first hour, but even Bruce Wayne isn't in the story that much, compared to Basinger's Vale, Knox, and Jack Napier/Joker. And the characters themselves are weird. Bruce Wayne is a guy who's so isolated by his pain and privilege that he has no idea how ordinary people live. (Keaton's anxious delivery and slight frame give the character a pathos that you wouldn't have gotten from a traditional action star or leading man, like Ford or Stallone.) Basinger's Vale is presented as a "normal" audience surrogate, but then you realize that she's a fashion photographer who has a thing for war atrocities and guys who like to sleep hanging upside down. Nicholson plays the Joker pretty broadly, but the character's nihilism is, if anything, more overt than Ledger's interpretation. The Nolan Joker subjects Gotham City to a series of elaborate Milgram-style psychological experiments to prove how gutless human beings are; the Nicholson Joker just wants to kill everybody to see what it's like, then document his murders as a work of performance art. What really stands out today is that there's no origin story. (Apart from the Joker's, that is, which supports some readings that he's really the main character.) Batman has already been active for months (or even longer) when the movie starts. We see one flashback to the Waynes' murders that takes up a minute of time. Today, any movie introducing or rebooting a superhero would spend at least an hour setting up the character's development and transformation, following the template established by Superman. (Apart from The Incredibles and Guardians of the Galaxy, the only other major exception that comes to mind is the original X-Men.) But Batman doesn't let us in on the character's history or mental state. It clouds him in mystery, and relies on the other characters for identification — hence criticism at the time that Nicholson was the real "star," even though his screen time is only slightly longer than Keaton's. In a lot of ways, the movie is the antithesis of the Spielberg/Lucas model beloved of Gen-X filmmakers. There's no hero's journey, there isn't even a character arc, it just unfolds like a bizarre, claustrophobic dream. But in other respects — particularly media representations — it's surprising to see how much influence Burton's version still has. The notion of the Batsuit as high-tech armor, versus a costume, originates here. So does the trademark "I'm Batman!" and the hero's growl-like delivery. The cartoon series took a more traditional approach to the material, but it kept Burton's aesthetic and Elfman's music. The Arkham Asylum games borrow heavily from Furst's production design. And the movie also introduced the idea of the Batmobile as a heavily armored (and armed) urban assault vehicle, as opposed to a high-performance sports car (though this might also have been influenced by Miller's Bat-Tank in Dark Knight Returns). The movie also introduced the idea of the hero's destiny and origin being intimately bound up with his archvillain's, rather than being completely unrelated (see also Batman Begins, Iron Man, and just about every other Spider-Man movie). 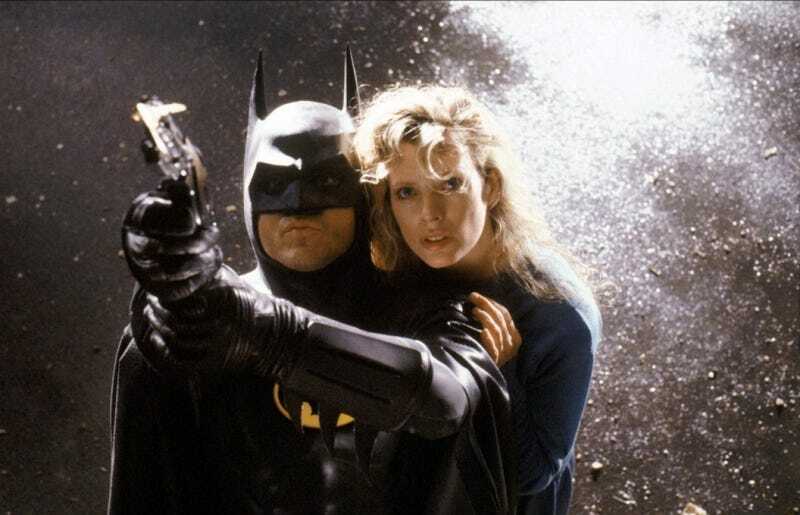 Hopefully, with Keaton's star back on the rise, viewers will give Batman a second look. It's nothing like today's superhero movies, with their elaborate universes and intricate narratives. But as a transitional movie, one that anticipated the development of the modern superhero movie — if it only indirectly shaped it — it's worth watching, especially if you've never seen it or haven't watched it since the fall of the Berlin Wall.